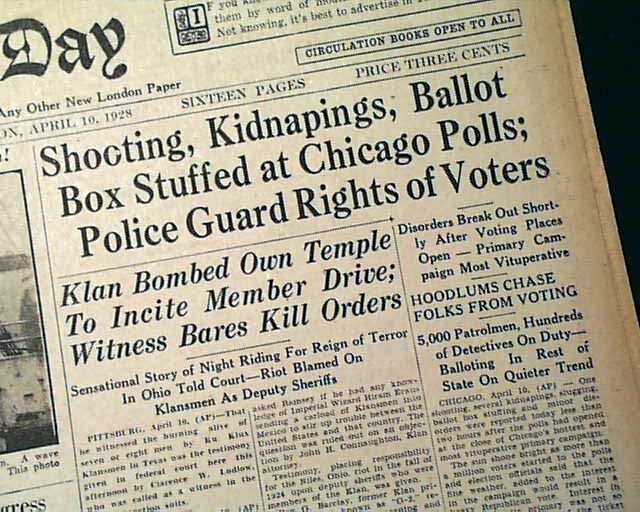 Probably no U.S. election in the 20th century can match the violence or social disregard of the April 1928 Republican primary in Chicago. Referred to by the press as the "Pineapple Primary," the event was characterized by the bombs, nicknamed pineapples, used in wholesale lots by gangsters seeking to have their ticket succeed. Both sides employed professional terrorists and the Capone ranks provided most of the bomb throwers. The police seemed singularly unable to stop any of the violence. In the primary, a rebel faction headed by Republican senator Charles S. Deneen challenged the ruling faction headed by Mayor Big Bill Thompson and State's Attorney Robert E. Crowe. 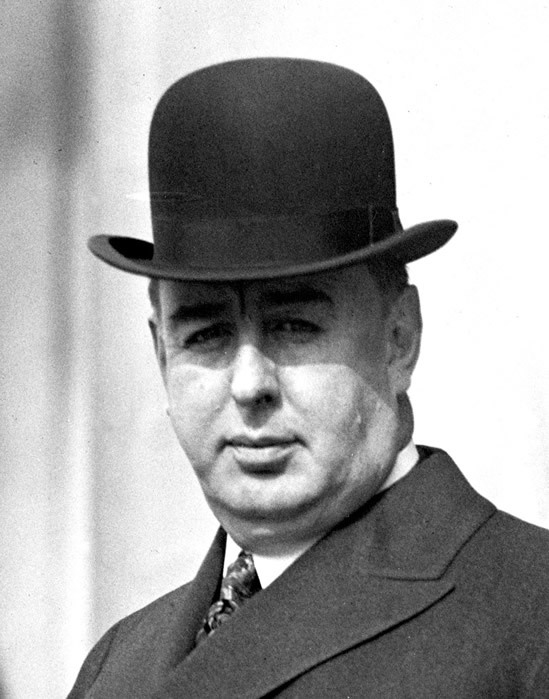 Thompson and Crowe were aligned with Governor Len Small, who, like the former pair, was a friend of mobsters. Deneen, carrying the banner of reform, was backed by racketeer Diamond Joe Esposito, who clearly desired to seize the Capone mantle for himself. Violence erupted on both sides at the primary. The first attack victims were the Thompson-Crowe men. The homes of Charles C. Fitzmorris, Thompson's city controller, and Dr. William H. Reid, the commissioner of public service, were bombed. Further bombings of Thompson-men homes followed when the mayor announced, "When the fight is over, the challengers will be sorry." Gave proof through the night that Chicago's still there. Two days before the primary, on Easter Sunday, the united clergy of Chicago—Protestant, Catholic and Jewish—denounced the Thompson-Crowe-Small forces: "We have a governor who ought to be in the penitentiary. . . . Ours is a government of bombs and bums.... O Lord! May there be a reawakening of public spirit and consciousness. Grant that we may be awakened to a sense of public shame...."
The appeal was not enough against the muscle, guns and bombs of the Capone forces, who supported the Thompson machine. And Cook County chicanery and fraud never reached a higher state of perfection than in this primary; ballot-box stuffing, voting under fictitious names, and harassment of voters numbered among the less violent crimes. Ultimately the Capone forces carried the day. In the general election, however, the result was stunningly different. Capone was astute enough to realize that the national and international outcry against the Pineapple Primary was the death knell for the Thompson machine. When 75-year-old civic leader Frank J. Loesch, the founding member of the Chicago Crime Commission, called on him and insisted that he allow a peaceful general election vote, Capone did so. "All right," Capone, who was famed for bragging that he owned the police, said, "I'll have the cops send over squad cars the night before the election and jug all the hoodlums and keep 'em in the cooler until the polls close." Capone's word became the police's duty. A dragnet swept the streets clean. "It turned out to be the squarest and the most successful election day in forty years," Loesch later related in a lecture at the Southern California Academy of Criminology. "There was not one complaint, not one election fraud and no threat of trouble all day." In the election, Chicago's voters turned out in unprecedented numbers to vote against gangsterism. Governor Small and State's Attorney Crowe were swamped, and every Thompson candidate went down to defeat in the backlash of the Pineapple Primary. However, Capone remained sanguine. His criminal machine had flourished during a previous reform regime, and he was confident it would survive another campaign of virtue. His power was too deeply intermeshed with the police, the courts and the ward politicians for him to be alarmed. His reasoning did not prove faulty.